Q: I’ve read your articles in the magazine and have seen you say in several that when we’re ready to plan our reunion, the first call we make should be to the convention bureau in the city where we’re thinking of meeting. We’re ready to start working on a 2016 reunion, but what will they ask me when I call? Will I have to pay or sign a contract? We’re not a big group … will they even be interested in talking to us? A: The answer is Yes! The convention bureau will most definitely be interested in talking with you! Their primary mission is to help groups just like yours hold better organized and more successful reunions in their destination. They exist to be of service to you, and to help your family members have an enjoyable reunion. If they’ve done their job well, by the time your reunion wraps up, you’ll all be talking about how soon you can come back. Even if you’re a smaller group, they want to talk with you! The other answer is No! The convention bureau won’t ask you to sign a contract, nor will they charge for their time or services. You will have to sign a contract with the hotel or resort you select, and with any caterers or tour companies you decide to employ. But even here, the convention bureau can help you navigate the contracting process and provide useful tips and advice. Finding the convention bureau where you’re thinking of meeting is easy … go online and search for “(Name of city) Convention and Visitors Bureau.” Likewise, you may wish to consider one of many destinations that advertise in Reunions magazine. These are cities and destinations that have shown a particular desire to serve your family and your reunion! What time of the year are you looking to hold your reunion? For how many days? What activities are most important to you and your family members? Sightseeing at historical attractions? Going to the beach? Shopping? Riding roller coasters? What type of accommodations are you looking for? A four-diamond hotel or a campground? A chain hotel with suites that caters to families, or a one-of-a-kind boutique property? How much are you expecting to pay for your rooms? What sort of restaurants appeal to everyone? Will your attendees be flying to the destination? Driving? Taking the train? Does anyone live locally? A destination that is “too far away” from many of your attendees or one that is “too expensive to reach” (i.e., folks must fly to get there and the air fares are expensive because of distance and/or limited service) will negatively impact your attendance. Based on your answers to these questions, the CVB representative will provide suggested options for your next steps, including securing a hotel, obtaining proposals from vendors and planning activities. 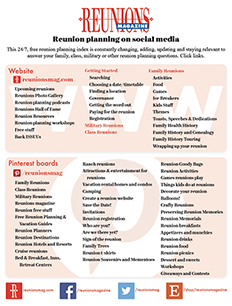 If you’re just starting to plan your reunion, you may wish to collect information from two or three different destinations, and compare what each has to offer. While you’ll never please everyone in your group, you’ll want to select the city and activities that will appeal to the most people. Waterparks and mini-golf are great activities for teens; conversely, many teens will likely be bored touring historic sites, battlefields, and art galleries. Destinations with casino gambling may not be the best choice, if you’ll have lots of children in attendance. Children under 21 aren’t allowed in most casinos, and many of the shows and other entertainment options are for adults. While younger, hardier members of your family may wish to sleep in bunk beds in a rustic lodge in the woods, the older members may prefer a hotel with softer mattresses and nice restaurants nearby. In the end, the city or destination you select will play a large role in how many people choose to attend the reunion, and how good a time they’ll have. If it’s a destination that’s relatively easy to get to, has plenty of things to do that your relatives will want to do, and can offer you accommodations, dining and activities that fit your group’s budget, you’ll have a successful, well-attended reunion! Dean Miller, national sales director for VisitFairfax (fxva.com), the convention and visitors bureau in Fairfax County, Virginia, is a great friend of reunions and is one of the very people he is writing about. Call him when you are planning a reunion in the Washington, DC, area. Fairfax County is nearby, affordable and conveniently located to all the area has to offer. Contact Dean at 703-790-0643; dmiller@fxva.com. Next Article Where, oh, where to start?